Includes a detailed inset map of Charleston. A New Map of South Carolina with its Canals, Roads and Distances from place to place, along the Stage and Steam Boat Routes. 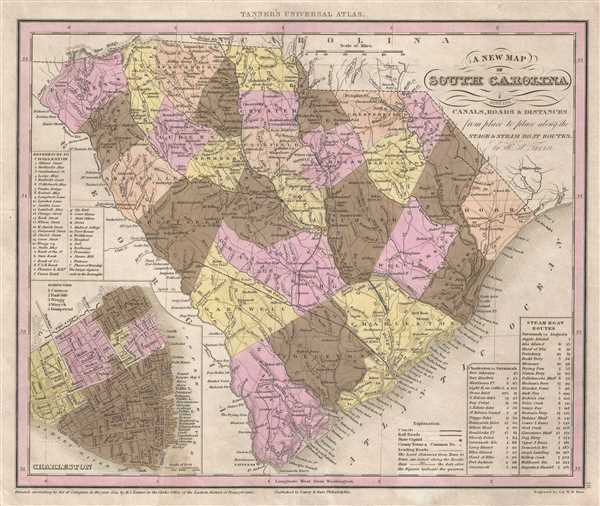 This is an 1845 Henry Schenck Tanner map of South Carolina published by Edward L. Carey and Abraham Hart. The map depicts the region from North Carolina to Georgia and from the point where North Carolina, Georgia, and South Carolina meet to the Atlantic Ocean. An incredibly up-to-date edition, this map features the route of the South Carolina Rail Road Company (which operated until 1894, when it was taken over by the Southern Railway, between Charleston, Columbia, and Savannah. As this company was founded in 1843, two years after Tanner created the original, Carey and Hart must have updated the plate after acquiring it from him. A highly detailed work, each county is illustrated, labeled, and shaded a different color to allow for easy differentiation. Numerous cities and towns are labeled throughout, along with rivers, creeks, and swamps. An extensive road network is depicted, as well as a handful of canals. Coastal locations are also labeled, from Savannah and the Savannah River to the Shallot River in North Carolina. An inset map of Charleston is situated in the lower left corner. The city's neighborhoods (referred to here as boroughs) are labeled and shaded different colors, in the same fashion as the counties on the larger map. Streets are labeled throughout the city, although twenty-one are identified numerically and correspond with an index above the inset map. Nineteen locations within Charleston are labeled alphabetically and are identified in the same index, while 'Places of Worship' in Charleston are identified by a capital 'C'. Two tables and a legend are situated in the lower right corner. One of the tables lists the waypoints along the route from Charleston to Savannah, indicating distance between each waypoint, and the total distance covered. The second table lists the steamboat routes from Savannah to Augusta in the same manner. This map was published in the 1845 edition of Carey and Hart's publication of Tanner's A New Universal Atlas. Edward L. Carey (April 7, 1805 - June 16, 1845) was an American publisher, aesthete, art lover, and the co-founder, along with Abraham Hart, of the prominent publishing firm Carey and Hart. Carey was the son of American publisher Mathew Carey and Bridget Flahaven Carey. He initially worked for his brother, Henry Charles Carey who, along with relative and partner Isaac Lea, purchased their father's publishing house in 1822, rebranding it as Carey and Lea. Eventually, Edward Carey became a junior partner in the firm, acquiring half of the shares belonging to Lea, and the imprint briefly changed to Carey, Lea, and Carey. On November 1, 1829, Edward Carey detached himself from his brother's firm and formed a partnership with Abraham Hart, an employee of Carey, Hart, and Carey. This firm, known as Carey and Hart, was successful for twenty-five years, publishing works by Henry Wadsworth Longfellow, William Cullen Bryant, and Eliza Leslie. Carey suffered from declining health during the last three years of his life. According to William Gilmore Sims, Carey died 'after suffering for some years from a tedious affliction of the spine.' Carey died on June 16, 1845 at the age of 40. Before his death, he was elected President of the Academy of Fine Arts, but declined the position due to his health. Abraham Hart (December 15, 1810 - July 22, 1885) was an American publisher of Jewish-Dutch descent based in Philadelphia. As a boy, Hart became an employee of the publishing firm Carey, Lea, and Carey. In 1829, when Edward Carey left his older brother Mathew Carey's firm, Edward and Hart joined forces, forming Carey and Hart. This firm became very well-known and was successful for twenty-five years, publishing works by Henry Wadsworth Longfellow, William Cullen Bryant, and Eliza Leslie. Hart married Rebecca Cohen Isaacks in 1831. Carey died at the age of 40 in 1845, but Hart continued the publishing firm until he retired in 1854, which marked the end of the Carey and Hart imprint. After retiring, Hart involved himself with industrial enterprises, and served both the Centennial Button-hole Machine Company and the American Button-hole Machine Company in an executive capacity. Hart was also an active member of the Jewish community in Philadelphia, serving for a time as president of the Jewish Congregation Mickvéh Israel, and assisting in Jewish educational and charitable enterprises. Tanner, H.S., A New Universal Atlas Contaning Maps of the various Empires, Kingdoms, States and Republics of the World. With a special map of each of the United States, Plans of Cities etc. Comprehended in seventy sheets and forming a series of One Hunderd and Seventeen Maps Plans and Sections (Philadelphia: Carey and Hart) 1844. A New Universal Atlas was, for close to twenty-five years in the mid-nineteenth century, the predominant American atlas and formed the foundation of one of the longest running atlas editions in American history, published from at least 1836 until at least 1859. Henry S. Tanner published editions of A New Universal Atlas in 1836, 1839, and 1842, when the plates were acquired by the firm Carey and Hart. Carey and Hart published editions of the atlas from 1843 through 1845, when Samuel Augustus Mitchell bought the plates from Carey and Hart. Mitchell published editions under the imprint Mitchell's Universal Atlas from 1846 until 1849, when he sold the copyright to Thomas, Cowperthwait and Company, which published the atlas from 1850 until 1854. The 1855 edition of the atlas was published by Cowperthwait, DeSilver and Butler, and then by Charles DeSilver from 1855 until at least 1858. Cushing and Bailey published the last editions of the atlas from 1858 until at least 1859.